Just a random eye look, on a ordinary Sunday. Applying Motives Eye Base* all over my lid to create a one colour base, taking Inika Cosmetics Certified Organic Eye Liner in Black Caviar*I lined my crease and a slight flick and started to blend it upwards. Selecting Sleek Makeup Au Naturel Palette* e/s in Bark I went over the black and blended it upwards too, if the black begins to fade you can go over it or do what I did a little later. On the lower lid I used W7 Neon Eyeshadow in Yellow* for a yellow base as I have trouble with getting yellow to be bright. 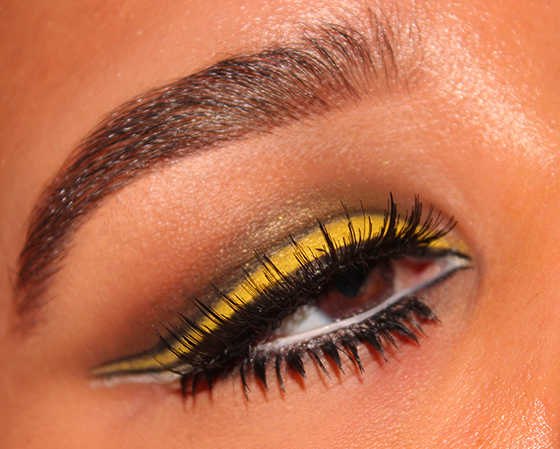 Sleek Makeup Glory Palette* e/s in Circle was patted on top of it to get the yellow vibrancy I desired. Curling my lashes using an eyelash curler, I followed up by using Motives Lustrafy High Definition Mascara*. Bourjois Pinceau Liner in Black I lined my upper lid and lightly went over my crease and gently blended that so it wasn't as harsh as my other line and in between those two lines I used NYX Jumbo Pencil in Milk and in my waterline. I applied Lashaholic False Eyelashes #LA07* as my chosen upper lashes and cut my KKCenterhk Bottom False Lower Lashes #A188* into individuals. So glad that for the first time in how long I got a yellow to work on my lid. Very very pretty, I love this! Reminds me of yellow jacket bees. I love it! Wow this look is so cool! 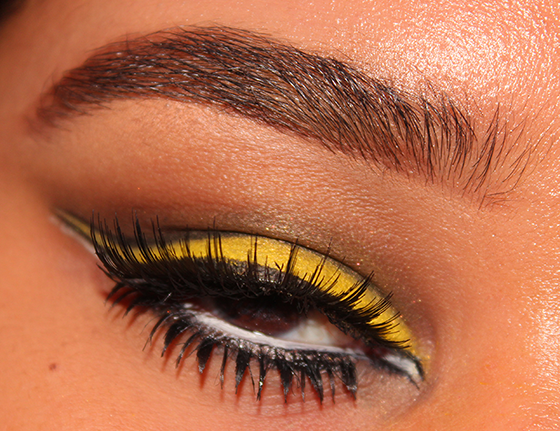 I wish i could rock yellow eyeshadow with my blue eyes!